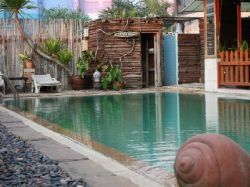 This chic property in the heart of Pattaya is ideal for those who seek the comfort of home with a touch of luxury. Perfect for leisure and business travelers, The Pinewood Residence is a contemporary serviced apartment, ideally situated just footsteps away from numerous activities, markets, shopping centers, restaurants, and nightclubs. The property offers clean rooms fitted with elegant furnishings and amenities which include internet access, a full kitchenette, and television. Tailored for every guest’s unique requests, The Pinewood Residence offers 24-hour security, an on-site restaurant, and tours for guests to experience all that the city has to offer.